di New York (1999), e la School of Business indiana (2004). di arte e di architettura medievale del Sud Asia. i templi Orissan, e l'architettura Hoysalas e Pallavas. Ha viaggiato molto nel Bengala occidentale, nel Bangladesh, Orissa e Karnataka. Amit Guha was born in Kolkata (India) and studied at the Indian Institute of Technology (1997), the State University of New York (1999), and the Indian School of Business (2004). He is a Management Consultant by profession and has lived and worked around the world in places such as New Jersey, California, Bangalore, Germany, and South Korea. 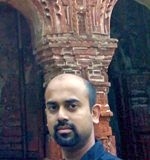 His current port of call is London where he divides his time between work and independent study of the art and architecture of medieval South Asia. His specific research interests are the terracotta architecture of Bengal, Orissan Temples, and the architecture of the Hoysalas and Pallavas. He has traveled extensively in West Bengal, Bangladesh, Orissa, and Karnataka. Photographs and notes from his travels are at ﻿http://www.kaladarshana.com.